Welcome to an introduction to computers. This is the first easy lesson of Introduction to Computers. This lesson has plenty of images and much less text than an encylopedia article. It emphasizes the basics. 1 What is a computer? See: What is a computer? View this podcast to find out about the history of computing. Charles Babbage, who is accredited with first conceptualizing the programmable computer w:Charles_babbage. Ada Lovelace, a mathematician who helped Charles Babbage by being the first programmerAda Lovelace. The Columbia Supercomputer - once one of the fastest. Supercomputers are fast because they're really many computers working together. Supercomputers were introduced in the 1960's as the worlds most advanced computer. These computers were used for intense calculations such as weather forecasting and quantum physics. Today, supercomputers are one of a kind, fast, and very advanced. The term supercomputer is always evolving where tomorrow's normal computers are today's supercomputer. As of November 2007, the fastest supercomputer is the IBM Blue Gene/L; it's 65,536 computers, each with two processors. It has a processing rate of 478.2 TFLOPS. 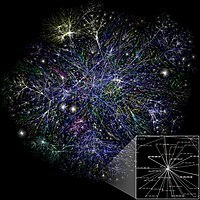 Search for Supercomputer on Wikipedia. Mainframes are computers where all the processing is done centrally, and the user terminals are called "dumb terminals" since they only input and output (and do not process). Mainframes are computers used mainly by large organizations for critical applications, typically bulk data processing such as census. Examples: banks, airlines, insurance companies, and colleges. Search for Mainframe on Wikipedia. Workstations are high-end, expensive computers that are made for more complex procedures and are intended for one user at a time.w:Workstation Some of the complex procedures consist of science, math and engineering calculations and are useful for computer design and manufacturing. Workstations are sometimes improperly named for marketing reasons. Real workstations are not usually sold in retail. Search for Workstation on Wikipedia. PC is an abbreviation for a Personal Computer, it is also known as a Microcomputer. Its physical characteristics and low cost are appealing and useful for its users. The capabilities of a personal computer have changed greatly since the introduction of electronic computers. By the early 1970s, people in academic or research institutions had the opportunity for single-person use of a computer system in interactive mode for extended durations, although these systems would still have been too expensive to be owned by a single individual. The introduction of the microprocessor, a single chip with all the circuitry that formerly occupied large cabinets, lead to the proliferation of personal computers after about 1975. Early personal computers generally called microcomputers, sold often in kit form and in limited volumes and were of interest mostly to hobbyists and technicians. By the late 1970s, mass-market pre-assembled computers allowed a wider range of people to use computers, focusing more on software applications and less on development of the processor hardware. Throughout the 1970s and 1980s, home computers were developed for household use, offering some personal productivity, programming and games, while somewhat larger and more expensive systems (although still low-cost compared with minicomputers and mainframes) were aimed for office and small business use. Search for PC on Wikipedia. Microcontrollers are mini computers that enable the user to store data, do simple commands and tasks, with little or no user interaction with the processor. These single circuit devices have minimal memory and program length but can be integrated with other processors for more complex functionality. Microcontrollers are important, they are used everyday in devices such as appliances and automobiles. Similar to mainframes in that they serve many uses with the main difference that the users (called clients) do their own processing usually. The server processes are devoted to sharing files and managing log on rights. A server is a central computer that contains collections of data and programs. Also called a network server, this system allows all connected users to share and store electronic data and applications.w:Server_(computing) Two important types of servers are file servers and application servers. Hardware refers to the physical elements of a computer. Also referred to as the machinery or the equipment of the computer. Examples of hardware in a computer are the keyboard, the monitor, the mouse and the processing unit However, most of a computer's hardware cannot be seen; in other words, it is not an external element of the computer, but rather an internal one, surrounded by the computer's casing. A computer's hardware is comprised of many different parts, but perhaps the most important of these is the motherboard. The motherboard is made up of even more parts that power and control the computer w:Hardware. In contrast to software, hardware is a physical entity, while software in a non-physical entity. Hardware and software are interconnected, without software, the hardware of a computer would have no function. However, without the creation of hardware to perform tasks directed by software via the central processing unit (box), software would be useless. Software, commonly known as programs, consists of all the electronic instructions that tell the hardware how to perform a task. These instructions come from a software developer in the form that will be accepted by the operating system that they are based on. For example, a program that is designed for the windows operating system will only work for that operating system. Compatibility of software will vary as the design of the software and the operating system differ. A software that is designed for Windows XP will experience compatibility issue when running under Windows 2000 or NT. The term "software" is sometimes used in a broader context to describe any electronic media content which embodies expressions of ideas such as film, tapes, records, etc. w:Software. Software is the electronic instruction that tells the computer to do a task. Firmware is both hardware and software. It is a computer chip that performs only one function. Used so that processing happens quicker as in video and sound cards. Computer data storage is referred to as storage or memory, which can save digital data. Examples are RAM, hard disks or removable memory sticks. In computer science a byte is a unit of measurement of information storage, that equals '8 bits', can be used to represent letters and numbers. w:Byte For example, the number 00000001 is 8 bits long, and represents the letter A. This page was last edited on 1 February 2019, at 08:37.